this pentacle will soften your anger and bring a sense of calm. An object of great power, it will serve as a link between you and the higher divine forces. It is made for you and you alone, nobody else should use it. 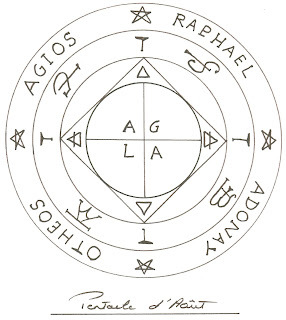 To make your pentacle you’ll need: a piece of white card measuring 10 x 10 cm, an ink pen and red ink and a red candle. Light the candle and say: « With this flame I light up my soul in the light of the Sun; Ray of truth, ray of knowledge, ray of nature, be with me in my endeavours, in my mind and my being. May the triple candle of grace light up my soul and protect me from problems and jealousies. May the strength of the light drive my work and empower my pentacle, so it may have the power to make my dreams come true. This is my will! 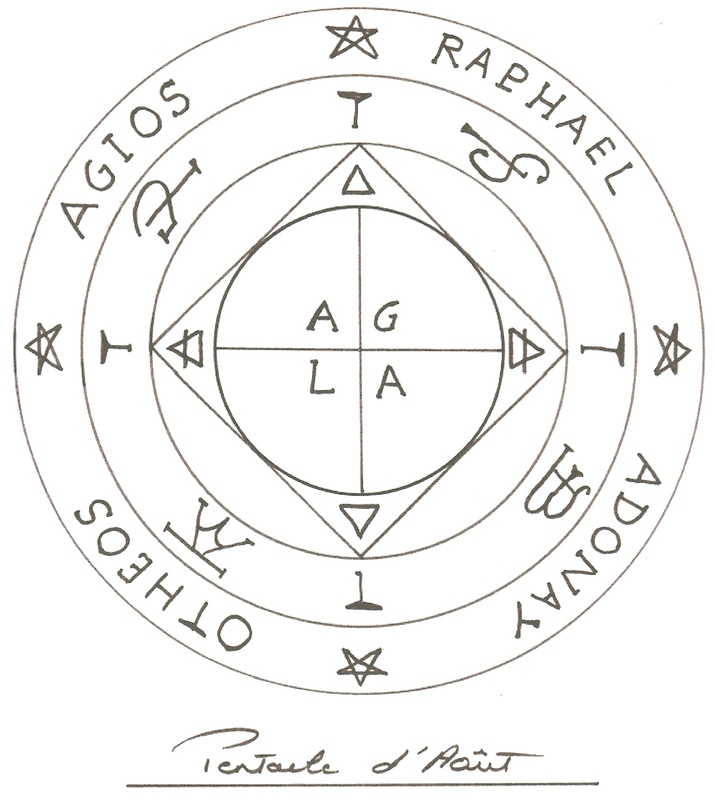 » Draw the pentacle in one line without stopping: draw the first circle then the second. Draw the central cross and continue with the five-point stars. Finish by writing in the magical names and signs. Press your hands on it and say the following blessing: « O all-powerful Adonaï, He is very powerful, Agia very holy, Aleph and the Tau, the beginning and the end; with great humility I beg and entreat you, Holy Majesty, that this August pentacle may be blessed by Your Power and prepared to receive virtue and the strength to bring renewed justice. In Your Name, O most saintly Adonaï, whose kingdom, empire and authority will survive all tests of time and last into infinity. » To finish, sign it on the back and then write below « help me ». Keep it on your for the whole month. At the end of the month, burn it in the flame of a red candle.